There has been considerable research and development into the use of multimedia in teaching and learning geospatial science. Geospatial science professions like cartography, geomatics and surveying are practiced-based and therefore are heavily reliant upon the application of knowledge to practical situations in the field. Action learning and action research establishes a learning environment in which students are actively engaged in building, testing and refining mental models. This paper discusses the development of a virtual field trip to facilitate action learning and action research to enhance the field experience obtained by undergraduate geospatial science students when preparing for fieldwork. Developing the virtual field trip to encompass field observation for a number of geographic scales is discussed as part of this paper. Preliminary evaluation has been undertaken with results indicating that students are able to obtain a general overview of the area into which they will be working and obtain background information in an interactive three-dimensional model that will enable them to maximise their experience when away on fieldwork. Further work into the development of new localised sites and more tools to assist students with orientation and navigation are required. Keywords: Virtual Reality Modelling Language, Virtual Field Trip, Nested Models, Action Learning. Action learning and action research assume that learning results from active experience (Kember, 1999). Traditionally, the delivery of information to students has been via what Michael and Modell (2003) term the "lecture hall" approach. This is achieved by an instructor (or lecturer) standing in front of an amphitheatre-style lecture hall with steeply ranked rows of seats armed with a blackboard (whiteboard) and projector screen. It is assumed that as the lecturer delivers information to students, they will "learn" that information, generally in a passive way. In contrast, action learning, which incorporates active learning, establishes a learning environment in which students are actively engaged in building, testing and refining mental models (Michael and Modell, 2003). Practice-based geospatial science professions like surveying and cartography are reliant upon the application of knowledge in practice. It is therefore imperative that theory is integrated into practice through action learning (Chien et al., 2002). Within the School of Mathematical and Geospatial Sciences at RMIT University, we teach geospatial science undergraduate programs that incorporate aspects of geography, and in particular physical geography, where the fundamentals of geomorphology, climatology and hydrology are covered. Interactive computer-based exercises are used to teach the principles of reading topographic maps. These exercises utilise an interactive map base linked to formative questions that focus on topographic relief and scale, and were developed using Macromedia software. These are linked to RMIT's Distributed Learning System (DLS) built around the Blackboard on-line platform. However, due to student numbers, and financial and time constraints, fieldwork is reserved for second year. As part of the second year, students participate in a field camp of four days where they are required to undertake a series of "mapping" activities. One of the activities is for students to assess hiker impact along popular walking tracks in the Grampians National Park in western Victoria, Australia. This paper discusses a project that was undertaken to test how effective the development and implementation of a virtual field trip (VFT) is for the preparation of second year undergraduate cartography and geomatics students for mapping fieldwork. In addition, the paper addresses how well the VFT facilitated action learning and action research through instructor directed exploration and examination of environmental biophysical factors in a real-world setting. Action learning and action research are seen as important aspects in undergraduate learning and enables students studying for practice-based professions particularly in the geospatial sciences, to be confronted with real-life applications. However many of the complexities and vagaries associated with real-world data make identification of specific yet important relationships difficult for undergraduate students. We set out with the intention of simplifying and removing some of these complexities through the adoption of a VFT. Through the VFT it was anticipated that students would be able to initially explore relationships between observed impacts and the natural variables that lead to variation in the levels of impact without the complexity of the real world. Once they have grasped these relationships it then becomes possible for them to be exposed to the complexities and vagaries of the real world and working with "real data". VFTs can simplify the complexity of reality in a readily accessible format, and enables the instructor to draw to students' attention, specific environmental relationships that may be missed on an actual site visit (Ramasundaram et al . in press). From earlier research undertaken by Counihan (2005), evidence shows that by providing additional information prior to actual visitation to a locality enhanced knowledge of that locality and in turn leads to a greater appreciation of that locality. Given time constraints there is a need for students to maximise their learning experience whilst away. 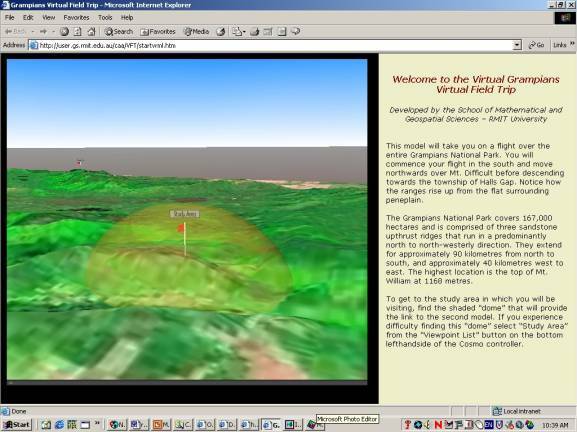 Virtual field trips (VFTs) are defined as being a collection of resources designed for the effective teaching and learning of fieldwork based on computer and web technologies. VFTs are virtual by the fact that no actual visitation to the location, takes place. However, according to Qiu and Hubble (2002), a VFT for geoscience teaching is comprised of explicit learning objectives, a related glossary, landscape images, video clips and quizzes. Students are able to learning at their own pace and are able to undertake, in a virtual sense, basic field exercises. VFTs vary in what is presented and the quality and approach of what is presented (Qiu and Hubble, 2002). These include VFTs that use a series of maps, text and photographs that read like a diary of activities on a field trip, for example the five day tour of the Grand Canyon developed by Bob Ribokas (2002), through to the Virtual Field Course hosted by the Geography Department at the University of Leicester (www.geog.le.ac.uk/vfc/index.html ). 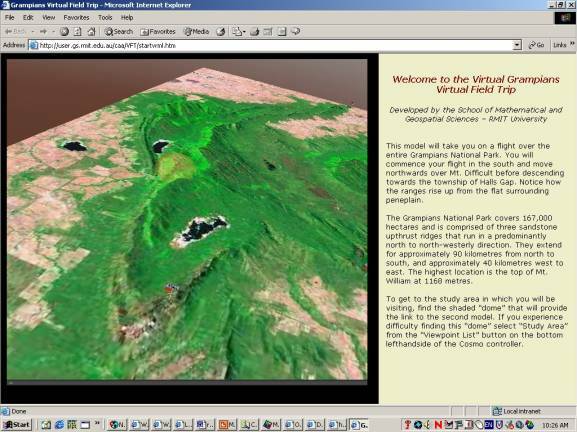 The Virtual Field Course is comprised of a number of exercises, including one based on a geo-referenced database, focussing on computer-based support for fieldwork. Likewise, the Department of Spatial Sciences at Curtin University of Technology in Western Australia, has developed the "Virtual Online Learning" (www.cage.curtin.edu.au/volearning/ ) that can be used to facilitate geographic concept learning using a number of spatial activities ranging from survey principles to thematic classification. VFTs are not new but this project incorporates a Virtual Environment (VE) for the study area, developed using the Virtual Reality Modelling Language (VRML), as the centrepiece of the VFT. VRML provides a ubiquitous, rather than dedicated, and cheap three-dimensional simulator that can be accessed via the Internet (Brodlie and El-Khalili 2002). 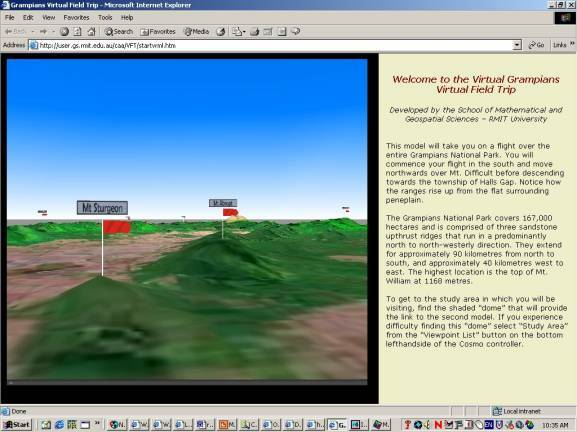 Klemm and Tuthill (2003) have demonstrated that VFTs can be used to augment field trips as well as provide a virtual alternative when no actual field experience is possible. In fact they go further by suggesting "VFTs can engage students in active learning and encourage them to think and solve real-life problems" (page 191). 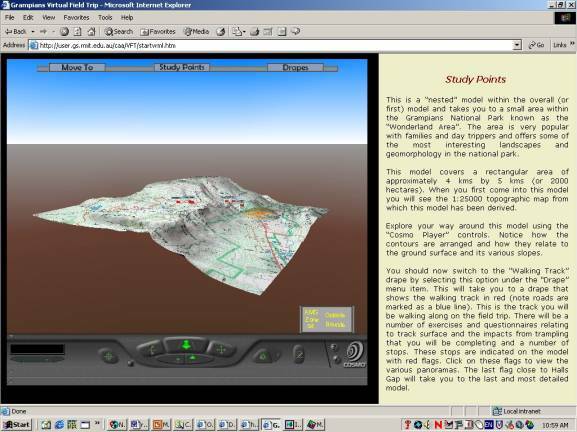 Moore and Gerrard (2002) found in their "Tour of the Tors - Virtually Interesting Project" of the Dartmoor Tors developed for university students, that given the ability to self navigate and travel "freely" around virtual scenes provided the means to gain additional knowledge not always available from fieldwork alone. Moore and Gerrard (2002) note that the "conjunction of multiple views of the world and/or data (multiple representations) stimulates a greater understanding or insight into that data. It is this synthesis as it is expected in the Virtual Field Course (VFC, 1999) that enhances the learning environment for the student. The availability of multiple representations: media, map data and virtual reality, of the same geographical region, each of which offers a different perspective of the place, improves the scope of student learning" (page 190). They can improve any well-known deficiencies in fieldwork teaching in time effective manner, not dependent upon non-proportionate data collection efforts. The Grampians National Park (GNP) in western Victoria, Australia covers approximately 167,000 hectares and with annual visits in excess of 1.5 million visits for the annual period from mid 2000 to 2001 (Parks Victoria 2005), is one of Victoria's most popular tourist destinations. The park is comprised of three sandstone upthrust ridges that run in a predominantly north to north-westerly direction for 90 kilometres. Whilst not high ranges by international standards, where the highest point is Mount William at 1168 metres, they do form a striking example of a cuesta landform standing above the surrounding peneplain. Students are taken to the Grampians and are expected to complete a series of field exercises. One of these exercises relates to examining the characteristics of hiking impact along walking tracks in the park. A model of susceptibility in the park has been documented in Arrowsmith and Inbakaran (2002). The first day of the field exercise, students are driven throughout the park and given an introduction into the geomorphology and derivation of these landscapes. Subsequent days are spent in the field, traversing walking tracks and taking field measurements such as slope and direction of a specific walking track, slope and aspect of the ground terrain, track surface type, depth of impact (gullying) and vegetation type. Locations are recorded using hand-held GPS receivers. Students are then asked to draw a map of the walking track showing recorded observed impacts and to investigate spatial correlations of observed measurements that lead to increased or decreased impact. What is clear is that students are exposed to work at a range of geographic scales. At an introductory level, students are required to gain an appreciation of the size and variability of the terrain contained within the park. In the past we used a series of 1:25,000 and 1:50,000 topographic maps to illustrate the complexity of the shape and topography of the park. Anecdotal evidence from students indicated that a clear appreciation of the steepness of the escarpments of the eastern slopes were under-estimated. Also under-estimated were the magnitude of distances between locations and the levels of difficulty of hiking tracks. Additionally our field visits have encompassed interest at least two geographic scales: general overview scale of the Grampians, and a detailed knowledge of single walking tracks. It could be argued that a third scale, that of specific sites along the track at which field measurements are taken, is also required. Scale variability was always going to present a challenge when developing the VFT. The complexity required at the site-specific level, for example a site might consist of a geographic area of radius 10 to 20 metres comprising the walking track, and adjoining rocks, trees and undergrowth, would overwhelm a park-wide model if it were to run over the Internet. In addition, for students to appreciate levels of impact and determine vegetation type, photos of real situations were necessary. Yet we also required students to be able to place walking tracks, and specific sites along them, in geographic context within the park. Hence it was decided that the VFT would be made up of "nested" virtual environment (VE) models at three specific scales, all linked geographically to each other. The first scale where students would enter and be introduced to the VFT, would cover the entire park. The second scale would encompass the popular �Wonderland Range' area, where students undertake most of their activities whilst in the field. The third and final scale would be site-specific and represent small study areas of specific interest. This third scale VE would incorporate many of their biophysical and human impact factors required by the students. Five sites demonstrating differences in environmental impact were identified in previous fieldwork. This would enable students to gain an appreciation for different combinations of biophysical variables and resultant levels of environmental impact from hikers along the tracks. Four stages were involved in the development of the VFT. In stage 1, all necessary spatial digital data were acquired and transferred as separate themes into ArcView 3.2, a widely available desktop GIS. These data were then exported as VRML files in grid or raster format. Stage 2 consisted of generating a digital elevation model with a 600 metre cell resolution, adopting a 1.5 vertical exaggeration for the park-wide model. Models for the study area, and site-specific locations were developed as part of stages 3 and 4. Stage 4 also included the acquisition of digital landscape panoramas for use in the site-specific models. In addition, formative questions were linked to the site-specific panoramas using HTML hotlinks. The data used to develop the VFT consisted of topographic maps, photographs of prominent locations and study points taken during a previous field trip, a rectified Landsat Thematic Mapper satellite image of the whole GNP, and digital topographic data. The primary data source used to develop the VFT was the State Digital Map Base (Topographic) dataset developed by the Victorian Department of Sustainability and Environment. This is a tiled vector data source containing a range of topographic themes including hydrography, vegetation, relief, transport, infrastructure, and administrative areas at a scale of 1:25,000. Using the topographic data index for this dataset, the appropriate tiles encompassing the whole GNP were selected and merged in ArcView 3.2 GIS. The most important layers in terms of developing a terrain surface were the 10-metre interval contour layers. Clipped from this merged dataset were the necessary contour data for the whole GNP and Wonderland Range models. These data were then converted to a grid surface of the appropriate cell resolution and exported from ArcView GIS into VRML format. A grid of 600 metre cell resolution was used to create the VRML terrain surface for the park-wide model. A range of larger and smaller cell sizes were tested but the 600 metre resolution grid provided the best mix of verisimilitude, acceptable file size, and interactivity. The vertical exaggeration of the terrain surface was set to 1.5 as it was felt that a student using the VFT would not fully comprehend the diversity of elevation throughout the park without this adjustment. Brown et al. (2002) noted that often when creating a credible representation of a virtual landscape, �white lies' are required, specifically mentioning the use of vertical exaggeration as an example of one such �white lie'. The Landsat Thematic Mapper (TM) image containing additional information including land cover, was then draped over the terrain to provide a further degree of realism. The TM image had a pixel resolution of 30m and was captured in the year 2000. Flags and flag poles with floating rotating signs were then positioned at prominent locations throughout the park (for example Mt Abrupt - see figure 1). Figure 1: Flags are positioned at prominent locations within the model. A partially transparent dome was placed over the Wonderland Range area, the second scale VE, to indicate its extent. A link to the nested, Wonderland Range VE model is incorporated into this dome (see figure 2). Figure 2: A transparent dome is placed above the topography to indicate the location of the second level model. Finally, a fly-through, which provides a guided tour of the GNP and its prominent locations, was integrated into the model to introduce each student to the park (see figure 3). The fly-through starts automatically when the model is loaded and was seen as being important in providing spatial context within the whole park of localised sites in which the students would be working. Fly-throughs are also seen as important motivators and if done properly should invoke the user's interest and attention (Dransch, 2000). Figure 3: A fly-through provided students the opportunity to visit the entire park area before entering the smaller study area. Like the GNP model, a variety of grids of varying cell resolution were tested in the development of a VRML terrain surface for the Wonderland Range VE model. It was determined that a grid of 50m cell resolution provided the best mix of verisimilitude, acceptable file size, and interactivity. Flags and flag poles with floating rotating signs were positioned at study points throughout the VE model. A partially transparent dome was used to indicate the extent of the Halls Gap township. To provide additional functionality and flexibility, a Heads-Up-Display (HUD) menu system was incorporated into this model. Using this menu system, the student is able to access a range of options including a viewpoint list, links to the GNP model and individual site-specific study point models, and two terrain drape selection options. The viewpoint list accessed through the HUD allows the student to easily visit each study point and other significant locations, therefore assisting in the development of an understanding of the terrain and study area. Miller et al. 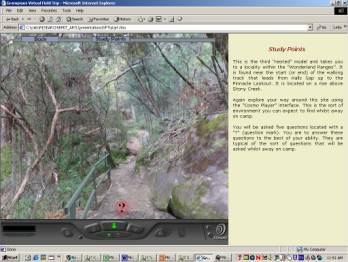 (2002) note that viewpoints provide reference locations to which users can return following exploration into areas which are not of interest. 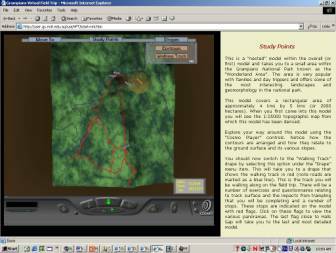 Also through the HUD, a student is able to alter the terrain drape. Two terrain drape options are offered with this model. The first is a scanned topographic map of the Wonderland Range area while the second depicts the roads and walking tracks the students use while on their field trip (see figures 4 and 5). Finally the student's apparent Australian Map Grid (AMG) location while traversing the terrain, within the VE model, is also provided within the HUD. Figure 4a: On entry to the second scale model a draped topographic map is encountered. Figure 4b: The topographic map can be interchanged with a map delineating the walking track with points of interest. Figure 5: The angle of view can be altered to reflect the three-dimensionality given by the second scale model . To enable students to gain some understanding of the relationships between biophysical properties along walking tracks and the impacts observed, five site-specific locations were identified from previous field visits. For each of these five site-specific locations a third level model was developed. These models are comprised of an enclosing semi-transparent hemisphere or dome that is placed over an approximation of the terrain at the location, therefore creating a completely enclosed study point characterisation. The terrain approximation was created based on measurements and photographs taken during a field visit to each location. Stitched 360 ° imagery taken at each location are placed on the inside of the enclosing dome, therefore providing a greater sense of enclosure and immersion. Other imagery of ground surfaces (such as rock and grass) was used to texture the terrain surface. Vegetation objects (for example trees and bushes) were incorporated using vegetation imagery collected while onsite. Using photographs enables actual vegetation, walking track surface and impacts upon it, and surrounding rock features to be observed much as they would in the field. A HUD was also incorporated into each of these study point models, enabling the student to return to the GNP, Wonderland Range or other study point models. Placed throughout each site-specific model are a series of embedded interactive question bubbles shown in figure 6. When a student interacts with each of these bubbles, a series of formative questions relating to the observations similar to what is expected in the field are provided to the student. These questions were developed with reference to the learning objectives of the VFT and focussed on topics such as track surface type, track slope, impacts from trampling and identifying adjoining vegetation communities. Figure 6: Site-specific models give the students an appreciation for the type of environment through which they will be traversing. Question bubbles enable interactive feedback to students. The VFT was developed for second year geospatial science students who attend a mapping camp in September each year. Due to time constraints we were unable to evaluate the VFT prior to their departure. It is intended to do this prior to the 2005 camp. As a preliminary evaluation postgraduate students in the School of Mathematical and Geospatial Sciences were invited to participate in the initial evaluation towards the end of 2004. We opted for a three-part questionnaire. The first part consisted of eight questions that sought general responses regarding whether participants had been involved with field trips at university before, and whether or not they had previously visited the study area. The purpose of these questions was to ascertain how participants felt about field trips in general, and to gain an understanding of their base knowledge of the study area. Out of the 17 participants, only two had never been on field trips, and five had never been to the study area. The second part of the questionnaire consisted of 17 statements for which we sought agreement or disagreement of statements, on a five-point Likert Scale, relating to their experience with the VFT. Statements included preference for participating in field trips, through to feelings of replacing fieldwork with the VFT and appreciation of the VFT to facilitate student learning. These questions enabled a quantitative analysis of responses to be undertaken. Subjective responses to three questions formed the third and last part of the questionnaire. Questions centred on what the participants found as the best and worst aspects of the VFT and how the VFT could be improved. most students disagree that VFTs should replace fieldwork. all, with the exception of one participant, would feel more comfortable about going on a field trip to the Grampians. This participant also expressed some concern regarding gaining understanding of the variability of impact along walking tracks. At least half of the participants commented in an open-ended question, that they found the fly-through and three-dimensional effects useful for giving a good topographic overview for the region. The biggest drawback was becoming disoriented within the model and having difficulty navigating along pathways through the model. The use of a two-dimensional index map would help alleviate disorientation, similar to the one used in a three dimensional VRML developed for tourism in natural areas (Counihan 2005). Given that one of the key objectives for the fieldwork is to ascertain how and where, given variable bio-physical variables, hikers impact upon walking tracks in mountainous terrain, it was felt that this objective was only partially met. Because of the complexity of building intricate detailed models, only one study site could be fully developed as a test case. Therefore multiple sites with variable biophysical features could not be encountered within the VFT. However, given the positive feedback in this initial study, it is felt that it would be worthwhile building upon the initial models and fully develop large-scale models at all five sites along the walking track. This should be completed before the 2005 field trip takes place to ensure that proper evaluation can take place prior to the fieldwork being undertaken. Hurst (1998) notes that one of the most important advantages of the VFT is its ability to portray information at a variety of scales. Our VFT was developed using the three-scaled "nested" model discussed in section 2.2, to enable a range of fixed scale models to be encountered, each conveying different types and amounts of information. However, even within a single model, students are able to move around and within the virtual environment and are able to zoom into specific locations or zoom out to get a complete overview of the locality, something unobtainable in the real field trip. This was noted in several responses from participants in the evaluations. Also noted by Hurst (1998), is the promotion of three-dimensional visualisation which is important for geoscience students to understand. Within a VRML model the students are able to move about a 3-D environment, rotate the environment, change viewpoints, take aerial and landscape views. Apart from the evaluative questionnaire we observed students working at their own pace. They were able to revisit sites, review formative assessment and obtain instant feedback on their individual responses, and explore the models uninhibited by other students or staff. This is a clear advantage in student-focussed learning environments, and not all students learn in the same way or at the same rate. Of course heading the disadvantages associated with using VFTs to replace "real" field trips are that VFTs are merely abstractions, or simplifications, of the real thing (Hurst 1998). There are many facets of a real field trip that are totally lost in a computerised VFT. Touch, smell, sound and other subtle information that collectively form a picture of the environment into which the students finds his or herself, are omitted from the VFT. However soundscapes could readily be incorporated in to each of the models. In terms of facilitating action learning and action research, the VFT did allow students to encounter a real world setting, albeit virtually. They were able to roam the VFT at their own pace within a series of nested models, each at a different geographic scale and corresponding level of detail. Whilst fundamental correlations between biophysical variables and hiker impact could be examined, it was felt that without multiple sites, these relationships could not be verified and also made understanding the relationships more difficult. For action learning and action research to be truly effective within this VFT, these sites must be fully developed. Despite the extensive developmental work already undertaken in this project, there is still a long way to go before full implementation is possible and therefore full advantages and learning outcomes for students can be achieved. First, and foremost, is the need to develop the remaining site-specific VE models along the designated walking track. Currently we have fully developed one of these sites, and this contains a number of linked formative questions embedded in the VE. However, given one of the underlying objectives of the field excursion, is to draw relative comparisons through observation, of impacts along walking tracks and to spatially associate impact with vegetation, and physical parameters (including slope, aspect and track width and surface, as well as distance along walking track), a variety of specific site locations with varying biophysical factors need to be encountered by students in the VFT. We have identified four other site locations, and have taken digital panorama photographs for each of these. Nevertheless, we now have a process in place to build the VE for each of these locations with relative ease. New formative questions relating to the specific aspects for each site will need to be designed, but technologically this should present little if any difficulty. Once these site-specific VEs have been constructed it should be possible for students to clearly identify those biophysical variables that correlate with high hiker impact. They will be led into observing this through carefully constructed formative assessment, as part of the Action Research Action Learning process. One of the project objectives was to use the VFT to teach and enhance the map reading skills of first year physical geography students. We now have in place a three-dimensional base model, the second scale VE, where we have draped the 1:25,000 digital topographic map across. Formative questions that link directly to the model regarding the shape of terrain and contour shape and separation, as well as calculation of distances using scale and simple co-ordinate calculations using grid co-ordinates supplied in the HUD in the model, need to be developed. group work may reduce the workload involved in assessing, grading and providing feedback to students." (CSHE , 2005). Group fieldwork can be emulated in the VFT through the use of discussion boards including threaded discussion groups using the facilities provided within the RMIT DLS, Blackboard. Debate, peer opinion and collective report writing, with input from the fieldwork co-ordinator can all be achieved on-line. Feedback from participants of the evaluation noted a number of small improvements including instructions for using browser controls, index maps for relative orientation, adding numbers to the questions marked on the site locations and improving image quality. These are relatively minor amendments and can be altered without too much difficulty in a future release. Finally, whilst not essential, a desirable outcome would be to find another university either in Australia or from overseas who are developing similar VFTs so that students can experience other destinations and participate in collective discussions with students from different cultures and backgrounds to enhance their own knowledge base. We have already participated in international collaborative projects for the teaching and learning of geography via The Online Center for Global Geography Education (Solem et al., 2003) developed under the auspices of the Association of American Geographers (refer to http://www.aag.org/education/center ). Our students saw this as a most advantageous exercise that enabled them to interact with students from another university in another country (in our case Utrecht University). The VFT discussed in this paper can be accessed at the following URL: http://user.gs.rmit.edu.au/caa/VFT/start.htm . 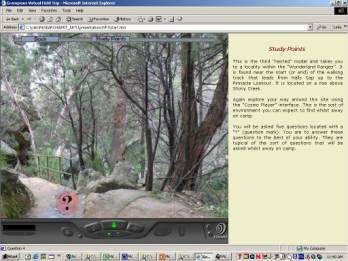 This paper discussed the development of a virtual field trip to the Grampians National Park in western Victoria. Part of the objectives for undertaking this work was to facilitate Action Learning and Action Research through the use of a virtual environment built using VRML, to enable students to "explore" a locality for which they were going to visit. Whilst virtual field trips are not new, this paper discussed the development of a virtual field trip that made use of a three scaled virtual environment "nested" model. Three scales enabled students to gain an overall appreciation for the study area, yet also explore some of the detail of localised sites and in particular examine the links between the biophysical variables and impacts from trampling from tourism. More work in building the virtual environment models for other localised sites should enable students to examine other localities exhibiting tourism impact. Initial evaluation has shown that whilst the majority of participants found the virtual field trip useful in preparing them for fieldwork, they experienced some difficulty in navigating the system. All expressed concern that a virtual field trip should not replace actual fieldwork. The authors would like to thank the students who participated in the initial evaluation. We would also like to acknowledge the research funds made available to develop the virtual field trip, through the RMIT Science, Engineering and Technology Portfolio. Arrowsmith, C. and Inbakaran, R. (2002). "Estimating Environmental Resiliency for the Grampians National Park, Victoria, Australia: A Quantitative Approach" Tourism Management, Vol 23: pp. 295-309. Brodlie, K. and El-Khalili, N. (2002). "Web-based virtual environments" in Fisher P. and Unwin D. (eds) Virtual Reality in Geography, Taylor and Francis, London, pp. 35-46. CSHE. (2005). Centre for the Study of Higher Education [on-line] at: http://www.cshe.unimelb.edu.au/assessinglearning/docs/Group.pdf accessed on 11 March 2005. Chien, W., Chan, S. W. and Morrissey, J. (2002). "The use of learning contracts in mental health nursing clinical placement: an action research", International Journal of Nursing Studies, Vol 39, pp. 685-694. Counihan, A. (2005). Online virtual environments for natural tourist locations, unpublished masters thesis, RMIT University. Department of Geography, University of Leicester (1999). 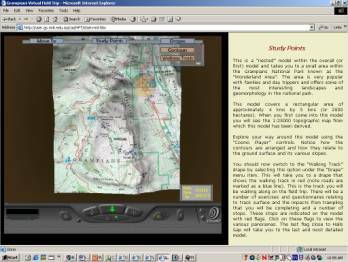 The Virtual Field Course [on-line] at: http://www.geog.le.ac.uk/vfc/index.html accessed on 20 December 2004. Department of Spatial Sciences, Curtin University of Technology (2003). Virtual Online Learning [on-line] at: http://www.cage.curtin.edu.au/volearning/ accessed on 20 December 2004. Dransch, D. (2000). "The use of different media in visualizing spatial data", Computers and Geosciences Vol 26, pp. 5-9. Dykes, J. (2002). "Information-rich virtual environments" in Fisher, P. and Unwin, D. (eds) Virtual Reality in Geography , Taylor and Francis, London, pp. 68-92. Hurst, S. D. (1998). "Use of Virtual Field Trips in Teaching Introductory Geology", Computers and Geosciences, Vol 24 No 7, pp. 653-658. Kember, D (1999). Untitled paper, [on-line] at: http://ettu618.edu.polyu.edu.hk/ALP/ar/ar.html accessed on 06 December 2004. Klemm, E. B. and Tuthill, G. (2003). "Virtual field trips: Best practices", International Journal of Instructional Media, Vol 30, No 2, Academic Research Library, pp. 177-193. Michael, J. A. and Modell, H. I. (2003). Active Learning in Secondary and College Science Classrooms: A Working Model for Helping the Learner to Learn , Lawrence Erlbaum Associates, New Jersey. Moore, K. E. and Gerrard, J. W. (2002). "A Tour of the Tors" in Fisher, P. and Unwin, D. (eds) Virtual Reality in Geography, Taylor and Francis, London, pp. 190-207. Parks Victoria (2005). Parks Victoria Visitor Statistics, [on-line] at: http://www.parkweb.vic.gov.au/resources/13_0201.pdf accessed on 7 March 2005. Ramasundaram, V., Grunwald, S., Mangeot, A., Comerford, N. B. and Bliss, C. M. (in press). "Development of an environmental virtual field laboratory", Computers and Education . Ribokas, Bob (2002). "Grand Canyon Explorer" [on-line] at: http://www.kaibab.org/trip/gc_05_96.htm accessed on 29 November 2004. Qiu, W. and Hubble, T. (2002). "The Advantages and Disadvantages of Virtual Field Trips in Geoscience Education", The China Papers, October 2002, pp. 75-79. Solem, M., Bell, S., Fournier, E., Gillespie, C., Lewitsky, M. and Lockton, H. (2003). "Using the Internet to Support International Collaborations for Global Geography Education", Journal of Geography in Higher Education, Vol 27, No 3, pp. 239-253. Stainfield, J., Fisher, P., Ford, B. and Solem, M. (2000). "International Virtual Field Trips: A New Direction", Journal of Geography in Higher Education , Vol 24, No 2, pp. 255-262.